California is destined to experience the big one at any time. After the shaking stops, how will you get in touch with loved ones across town or throughout the region when there is no power, no phone service, little if any cell coverage and no internet? Are you prepared to the silence that follows the big one? Amateur Radio Operators (or Hams) are poised to “make some noise” in the aftermath of a major temblor. Hams have the capacity and the skills to provide some of those initial vital links to those outside the affected area. When disaster strikes who will you call? You may want to contact a Ham radio operator or, better yet, even become one. Interested in learning more about what Amateur Radio Operators can do? The Crescenta Valley Radio Club will be participating in National Field Day activities on June 23 & 24th in Verdugo Park (across from Glendale City College). 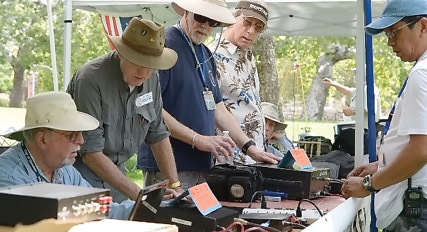 On Field Day, amateur radio operators take their equipment and expertise “to the field” to make as many contacts as possible across the US and Canada over a 24 hour period. While Field Day has been termed ham radios “Open House” it’s deeper purpose is disaster preparedness as radio operators practice communicating under circumstances that mimic the displacement of a disaster. Operators will be on duty beginning at 11:00 am Saturday morning and continuing for 24 hours. You are invited to visit, ask questions, and see how this wonderful pastime can play a crucial role in providing communication to the outside world when disaster strikes. You may even want to learn how to earn your own Federally granted amateur radio license and join the effort to serve those in need. For over a half a century the Crescenta Valley Amateur Radio Club has been providing communication services to the community. Stop by and see how Ham radio today is utilizing both the digital and analogue techniques and blending them together into new communication modalities. Ask to see how a seemingly simple hand-held radio can communicate with fellow operators literally around the world. You can talk to other Hams who are actively building a high-speed mesh network that is intended to provide back-up communications for essential county medical facilities in the aftermath of a disaster. It is a project created, funded and operated by Amateur Radio Operators of Los Angeles County.